Innovation: Artifacts of History brings unique and significant objects from the past to the table. Artifacts look and behave like normal Innovation cards, but they are significantly more powerful. Some feature Compel effects that impact opponents who are ahead of you in icon count. By collecting and using them efficiently, you can swing the balance of the game in your favour. Instead of Special Achievements, there are also five Relics you can claim - lost cards from each of the five innovation sets. You can take them as achievements or use them, but be careful: if you put the Relic in your achievements pile, your opponents may be able to steal it. 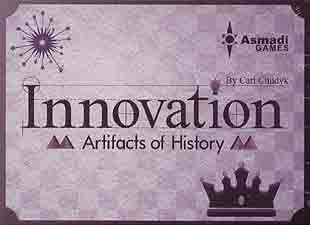 This is not a standalone game, the base set of Innovation (Third Edition) is required to play. Artifacts in History can be used with or without other Innovation expansions. Features updated cards, graphic design and artwork.